Thirty-one Sarasota County schools with garden programs have received rain barrels from UF/IFAS Extension Sarasota County. The beverage distribution company, Redi-2-DrinQ Group, donated 50 barrels to UF/IFAS. Rain barrels reduce stormwater runoff and conserve water by collecting rainwater that can be used for plants and gardens. The donated barrels are wrapped with a banner featuring the nine principles of Florida-Friendly Landscaping: Right Plant, Right Place; Water Efficiently; Fertilize Appropriately; Mulch; Attract Wildlife; Manage Yard Pests Responsibly; Recycle; Reduce Stormwater Runoff; and Protect the Waterfront. The wrapped barrels provide educational schoolyard demonstrations that help schools conserve resources. Elementary schools that received barrels are Alta Vista, Brentwood elementary, Emma E. Booker, Gocio, Southside, Garden, Glenallen and Taylor Ranch. Middle schools are McIntosh and Oak Park South. High schools include Riverview, Suncoast Polytechnical, Pine View and Venice. UF/IFAS Extension offers monthly rain barrel workshops where residents can learn how rain barrels conserve water, save money and reduce stormwater runoff. The workshops provide practical tips on constructing and installing rain barrels. Sarasota County government offers rain barrels for $37, including tax. The next class is 10-11 a.m. Nov. 17 at Twin Lakes Park. 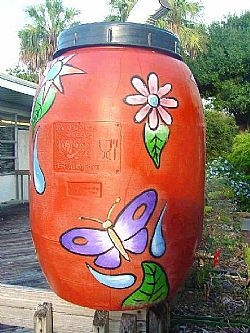 For more information on rain barrels, contact the Sarasota County Call Center at 941-861-5000, or visit the Sarasota County Extension website.